One of the easiest ways to grow your blog is to be generous by promoting other people. With digital marketing, when you promote others, they promote you; it’s mutually beneficial. Call out and link to businesses and influential people in your market who are doing something worthwhile. You can use other businesses as an example for your readers to learn from. Following are eight ways for you to create generous pieces of content. Write a profile or bio of an influential person in your niche. You don’t have to ask his or her permission first, but you can if you want. Be sure to notify this person via email, phone call, or social media that you have profiled him or her. This way, the influential person will have an opportunity to share the finished post with his or her audience and point people back to you. In this post, ask three or more experts in your industry the same question and aggregate the answers into a single article. For example, if you’re in the fitness industry, you might reach out to top physical trainers and ask them to outline their favorite cardiovascular workout. Then aggregate the responses of the experts into a single post to create an article with multiple opinions. The content from a crowdsourced post is top notch, easy to put together, and will be shared by many of these influential people. Not to mention, this type of post draws large numbers of the influencers’ followers to both your blog and your site. In our experience, when you get ten influencers to give you about 100 words each on a single topic, you’ve got a powerful blog post. For the interview post, reach out to influencers in your market and create a post around the questions you ask them. You can write the post in a typical newspaper or magazine style, or simply list each question asked and give each answer verbatim. Even the most influential people are surprisingly willing to give you an interview — even if you have a small audience for your blog. The easiest way for an extremely busy influencer to give you an interview is through an audio recording. Text interviews are time consuming, and video interviews can be technically challenging, often requiring the influencer and the interviewer to be in the same location. With audio, you can record the interview over the phone or use a tool like Skype. For this type of post, you gather multiple pieces of content from outside sources that your audience will find relevant and interesting. Provide a description of the content and link to it. It’s that simple. The articles you link to may not even have a common thread other than they’d be relevant or interesting to your readers. This content can take the form of what your company is reading and then link to different blogs, articles, and books you’ve gained value from. Another option is to use a tool like BuzzSumo to find the most socially viral content on a given topic and aggregate it into one post. A post like this can work well as a series that publishes once a week or once a month. Remember to notify those that you link to via email or social media to give yourself the maximum opportunity to get the post shared by the people you’ve included in your link roundup. Quotes are inspirational and thought provoking, which is why they make for an excellent blog article. Pull together quotes from multiple influencers across a specific topic to create a quote post. Again, if applicable, be sure to notify those you quote that you have included them in your post. 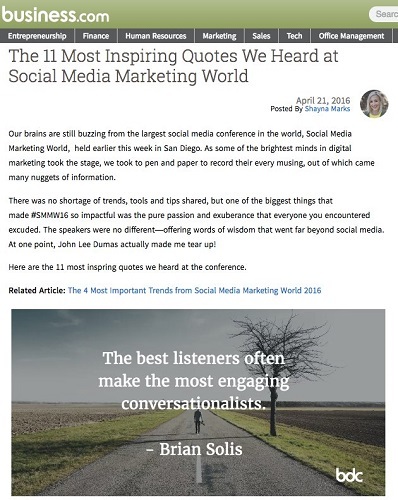 This image shows a post by Business.com that collects and links to its favorite quotes from Social Media Marketing World. In the blog post, Business.com doesn’t put the quotes in a numbered list but rather takes the time to make the quotes visually appealing and uses images that make the post more engaging. An example of a quote post from Business.com. Similar to the roundup post, the best of the web often includes content, tools, and other resources you are willing to put your name behind and call the best. In the post, curate, link to, and briefly describe what it is and why it’s the best. This post might take the form of your favorite blogs or your top picks for website design. It’s another great way to provide value for your readers while also promoting influencers whom you want to work with. Going off of the best-of-the-web post, the pick-of-the-week post is a series post that is fairly popular among bloggers. This blog article might be your favorite blog, podcast, tool, or other item of the week. The content is usually relatively short and describes a single article, tool, or other resource that you curate, link to, and describe. In this post, you recommend which experts or businesses your audience should be following. Collect a list of influential people, describe them, and provide links through which your audience can connect with the influencers via their website, social media channels, events, and books.